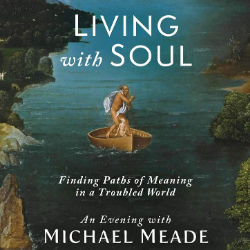 Join renowned author and mythologuist Michael Meade for an evening of surprising ideas, a soulful and mythological view of current affairs and a resounding collective call to find unity and wholeness in this time of conflict and confusion. The current loss of meaning in life and denial of truth imperils the heart and soul of human culture. Changes at the level of the individual soul can generate the collective energy needed to change the conditions of the world. This is an event about the necessity making soul at a time when the world seems to be losing its soul.